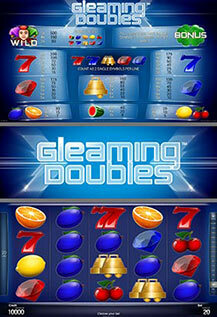 Gleaming Doubles™ is a 20-line, 5-reel video reel game with an innovative bonus concept. JOKER substitutes for all symbols, except the BONUS symbol. All wins are on selected lines for combinations from left to right. Scatter wins pay anywhere and are added to line wins. Reels can be started and stopped by pressing on the corresponding reels area on the touch screen. 4 BONUS symbols on the first reel trigger a re-spin feature. All BONUS symbols on the screen are locked and the remaining reels re-spin. This will repeat until either all reels are covered with BONUS symbols or a re-spin does not produce any additional BONUS symbols. If all reels are covered with BONUS symbols, 15 Free Games are triggered. Re-trigger of 15 Free Games is possible on the last spin. If first reel is covered with 4 equal symbols during the free games, all identical symbols and any JOKER symbols are locked and the remaining reels re-spin. This will repeat until either all reels are covered with equal symbols or JOKER symbols or a re-spin does not produce any additional equal symbols or JOKER symbols on any of the re-spin reels.